No post this week. You noticed, didn't you? 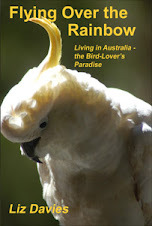 Just too much going on at the moment: taxes, thinking about getting a new car, other general life issues. 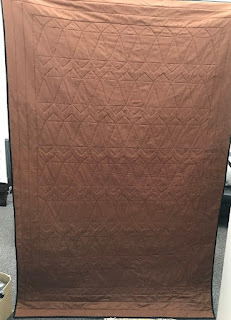 And I haven't done much quilting, although I've got one mounted and ready to go on the Handi Quilter, and another top nearly ready to sandwich. So I'll try to be a little more dilligent in the next week or so and get some things done to show you. Quilt 104: Red/White/Black Jelly Roll Race - DONE! 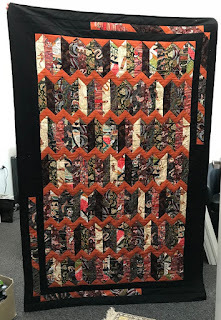 It's been almost 2 years since I made my first "jelly roll race" quilt. Time to do another! I think this one is my 4th. 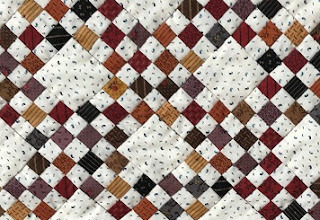 These quilts are loads of fun to make and, boy oh boy don't they whip up in a flash! 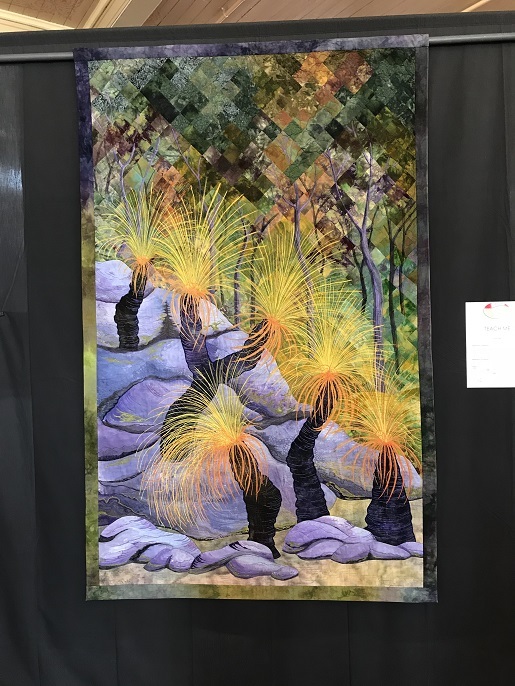 If you'd like to see how it's done, have a look at the video tutorial on YouTube by "Jenny" of Missouri Quilts - click here. 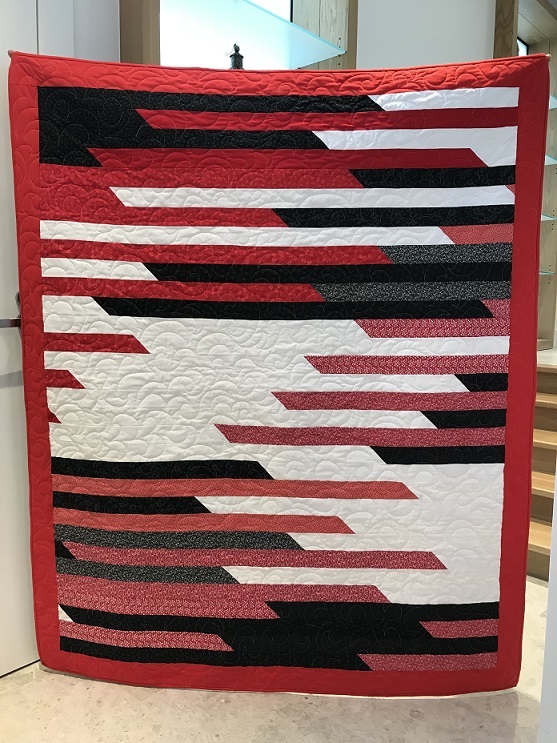 I'm really pleased with how it turned out - and also pleased to have stitched it using the "nested C" free-motion quilting design I posted about a couple of weeks ago (to see that post, click: here). 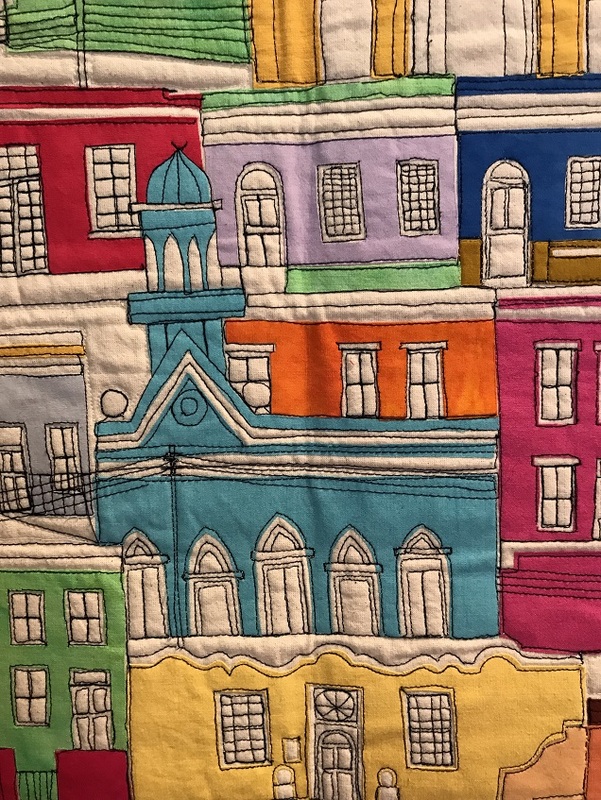 Here's a close-up of the quilting. 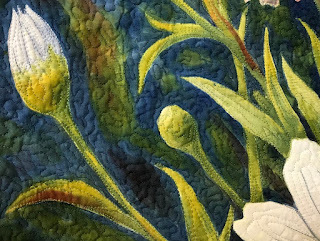 I was very nervous starting out with this, but quickly learned to relax, and as with all free-motion quilting, when you relax, the quality of the work gets better. 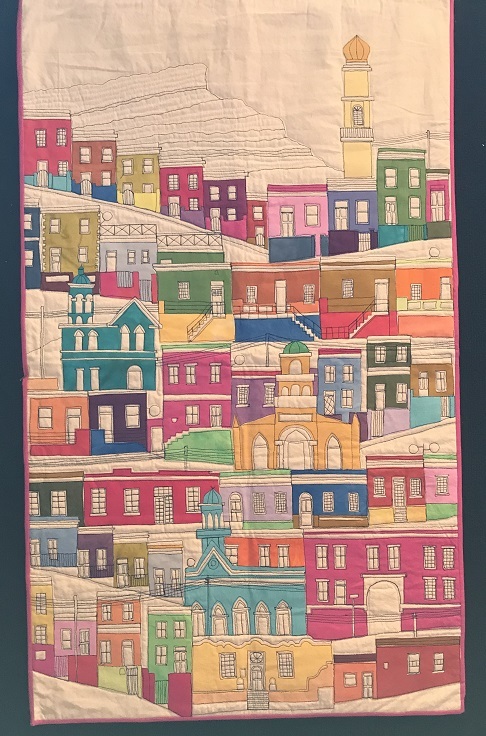 Here's tha back of the quilt. 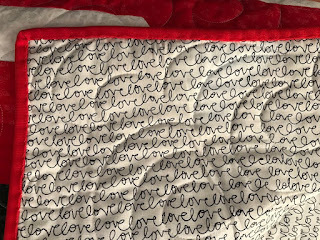 I usually use solid fabrics, but found this "love love love" print at Spotlight when they were having a quilting fabric sale. 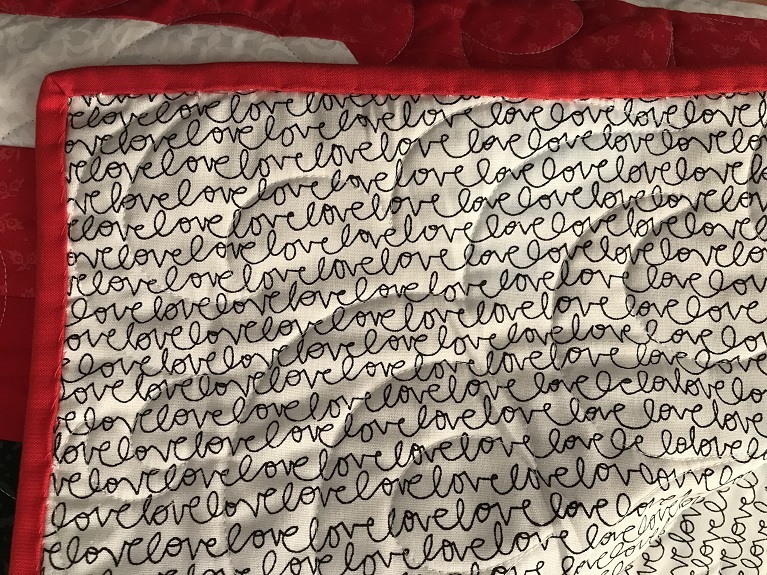 It's just perfect for this quilt! 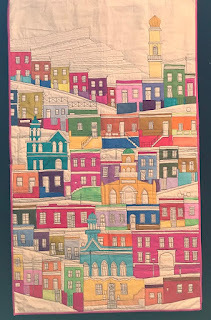 Jelly Roll Race quilts are the fastest quilts I've done. The time to piece the top is only a couple of hours (Jenny says it takes less than an hour, but I just don't sew as fast as she does), and with the super fast "nested C" free-motion design, the quilting was less than 90 minutes! It opened today, and did I go? You bet your boots I did! This is the 4th consecutive year for me attending and, well, I just wouldn't miss it for the world. It's held in the Royal Exhibition Building in Melbourne. 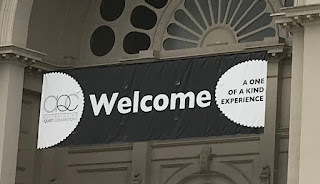 The sign over the door promises "a one of a kind experience". Well, let me tell you: they deliver on that promise! 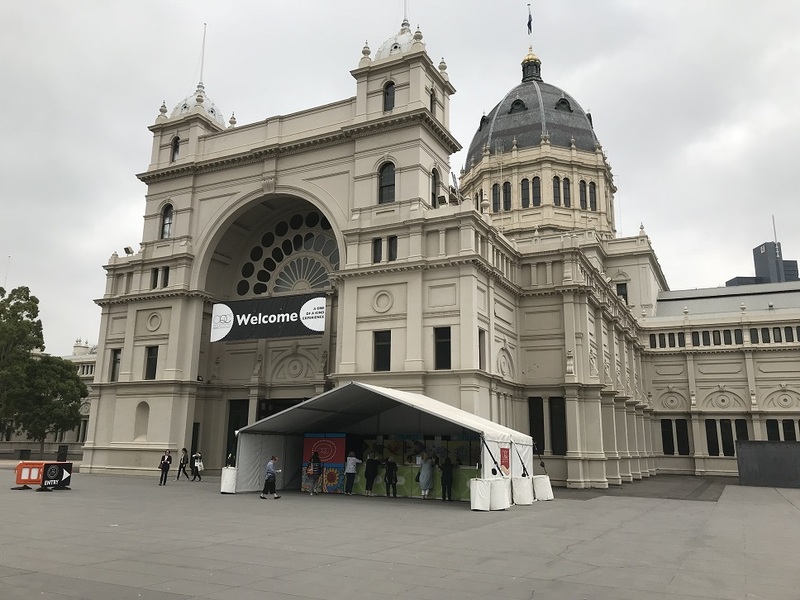 There's a huge number of stalls with vendors showcasing the latest and greatest in tools. Lots of fabric shops there, too, and many with bargains (if you have a keen eye). 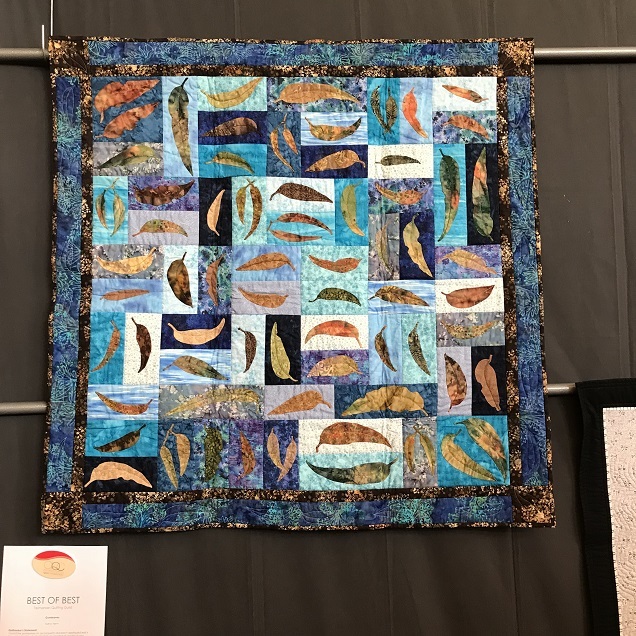 And, of course, quilts. Hundreds of them in diffent sizes and styles. 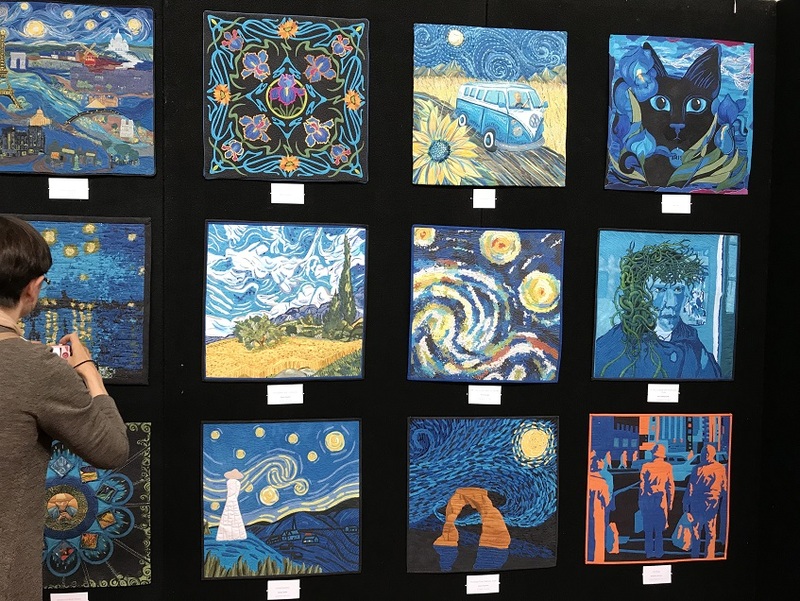 You can learn a lot (and get lots of inspiration) by looking at these masterpieces. 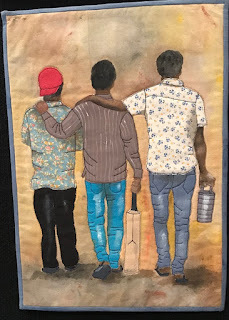 Like this one - a fabric painting done in applique. I don't do applique, myself, but I have gotten interested in making quilts with pre-printed panels. 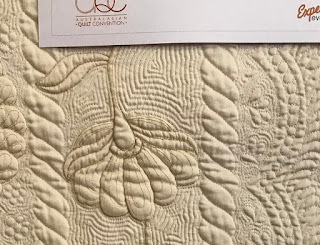 Quilting the panels has been challenging for me because I really want to "free motion" quilt those, and get away from using groovy boards. But I get hung up on free-motion outlining and whatnot because I'm afraid what I'm doing won't be perfect. It's absolutely stunning - even more so because the quilter didn't hobble herself (hiself?) with demanding perfect outlines. The stitches are controlled, but not overly so, and the results are simply amazing. I'm going to keep this in mind with the next panel I do. Here's another applique quilt. I love the simplicity of it -gum leaves cut from batik prints and arranged in regular-sized rectangles of a contrasting batik. It's just charming. 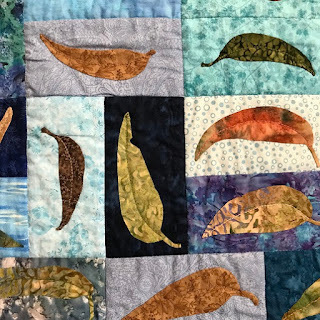 The artist says she based each leaf on the shape of a real leaf. And look at the one in the center here - it's had a chunk bitten off! I love it! ...and look at the detailed, intricate appliques. Amazing! This one used a combination of applique with thread-painting - and it just glows. 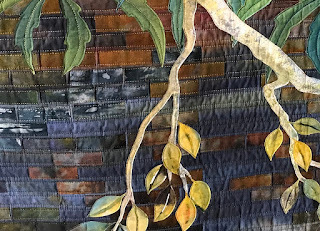 The orange and yellow "leaves" are not applique - they are stitched. A very effective use of the technique. This one blew me away - twice! 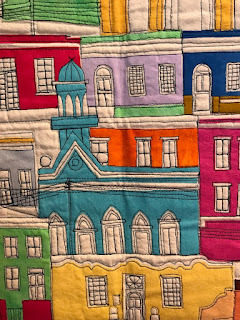 First - have a look at a closeup of the stitching. MICROSCOPIC! Get me some smelling salts, will you? 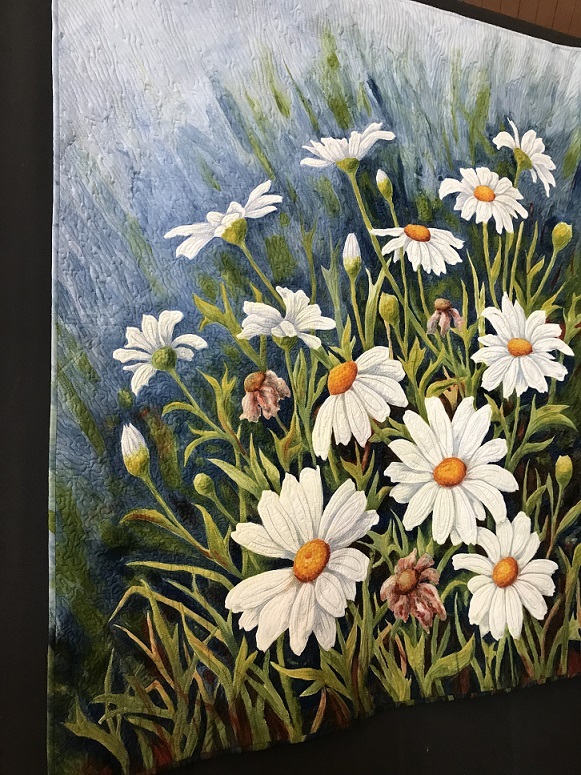 The piece below is small, maybe 12" x 24". But it's really sweet. Looks like a painting, yes? No. It's applique and stitching. ...until you get close. 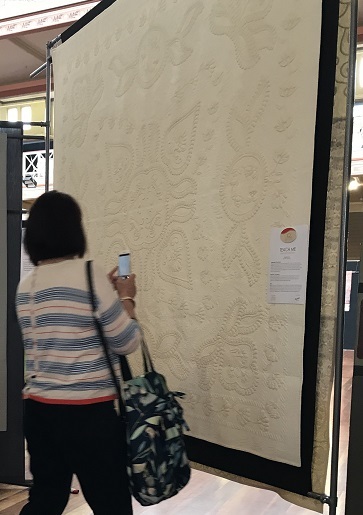 The quilt is made of a single cream panel with coloured appliques that have intricate cut-outs for the windows and doors. 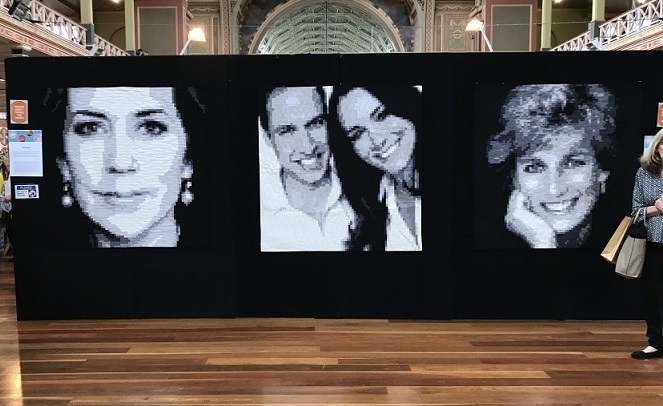 It must have taken ages to do - and it's lovely. Here's another knockout, a prize winner and rightfully so. Simple, yes. Easy, NO! Those little squares are only a half inch! And they are PERFECT! 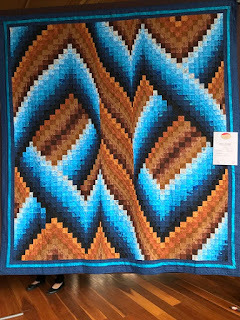 And here's a mind-blowing bargello. 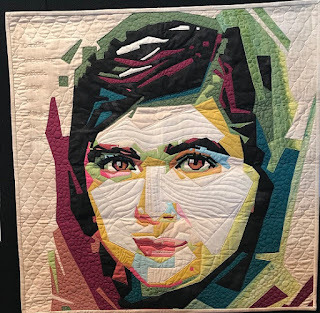 There are always a few portraits of famous people, like Malala. This is not a large quilt, just a little more than a square meter, but it is powerful. 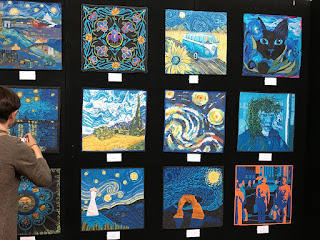 I stood nearby for a while and listened to the other visitors at the show as they approached it. 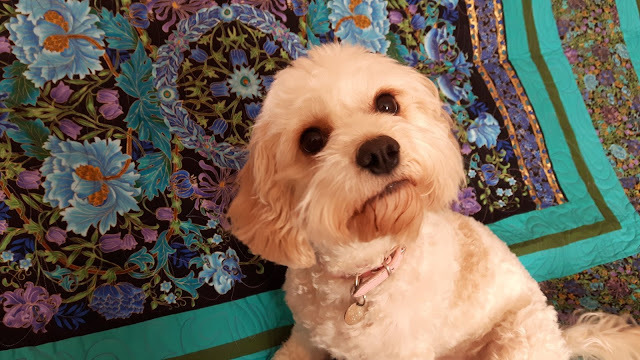 They all knew her name, and spoke it softly - with obvious affection and respect. This portrait of Obama is fairly large (not sure of the dimensions, maybe 2 square meters?) 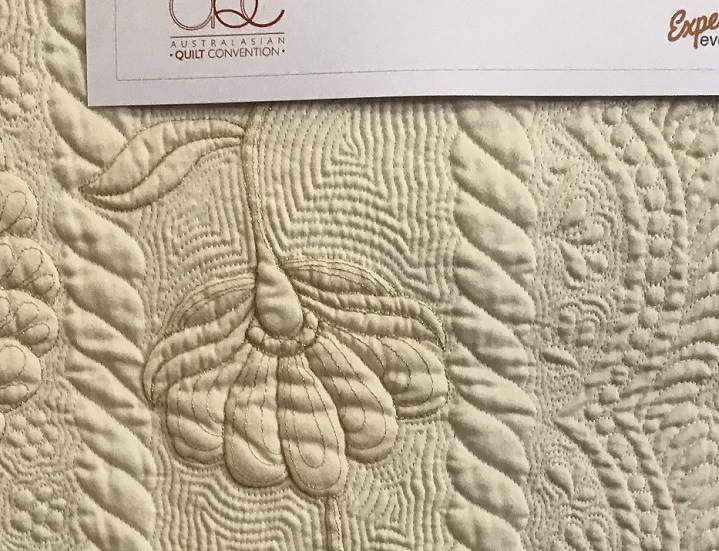 and interesting because it's done on a single cream cotton panel, with the quilting giving a subtle American flag design (actually - VERY subtle, as I didn't even notice the flag design until I got home and looked at my photo of it). 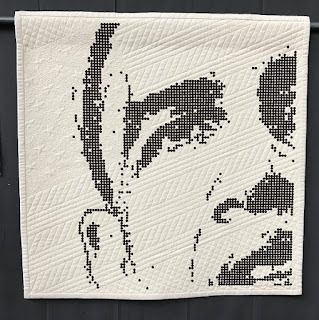 The dots making up the face are made up of batik fabric which has been bonded to the quilt. These portraits of royalty are impressive, but they have a kind of "manufactured" look, as opposed to hand crafted. A little too industrial for my taste, but there you go. 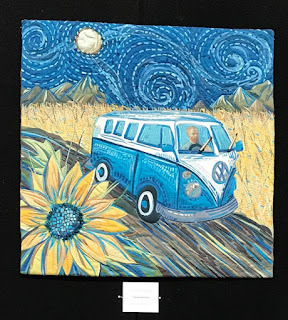 Much more fun is the Van Gogh "challenge". 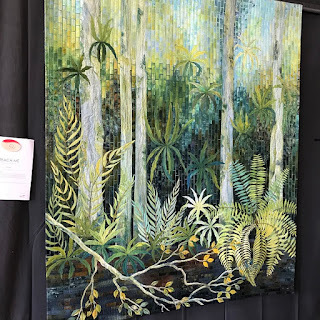 The panels are small and each one is an image inspired by the great impressionist. There's still 3 days left in the convention. Go and see it if you possibly can! Oh, I'm proud of this one. I really am! 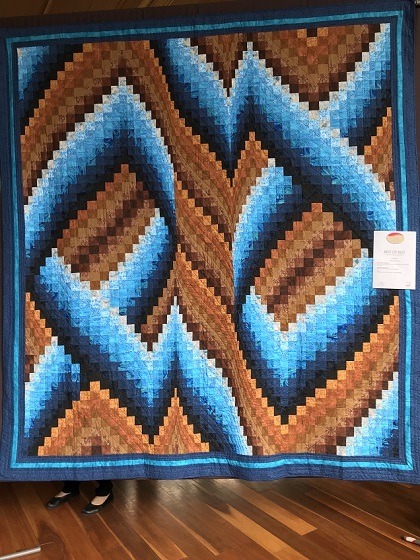 I posted about this project a few weeks ago: "Indigenous Zig Zag"
I bought the fabric at last years' Australasian Quilting Convention here in Melbourne. 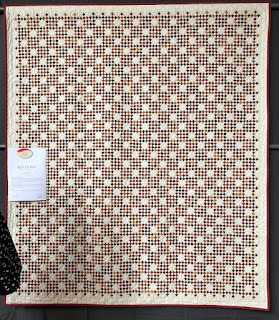 It was a very large bundle of fat quarters, each piece a different design inspired by Australian aboriginal art work. 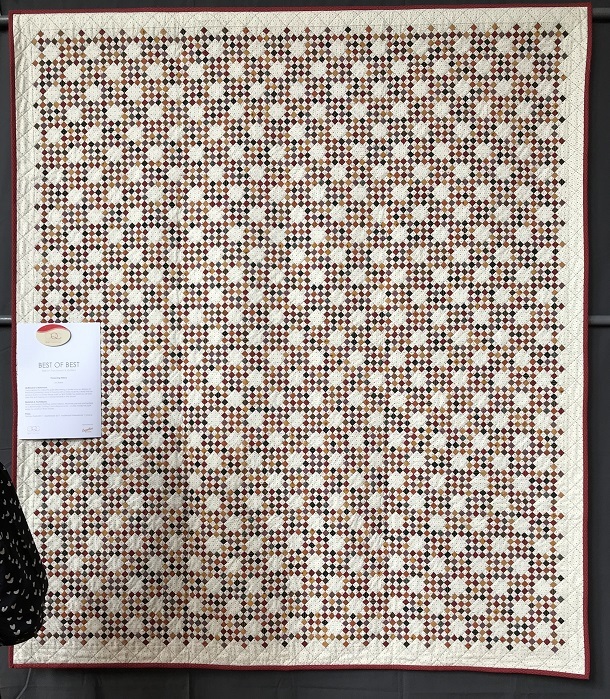 I pulled out the gold/red/brown prints and used a quilt design I'd purchased in Florida several years ago (but hadn't gotten around to making). Well - here it is! It's 50" x 75" with 100% cotton batting. There are 463 individual pieces - that may be a new record for me. 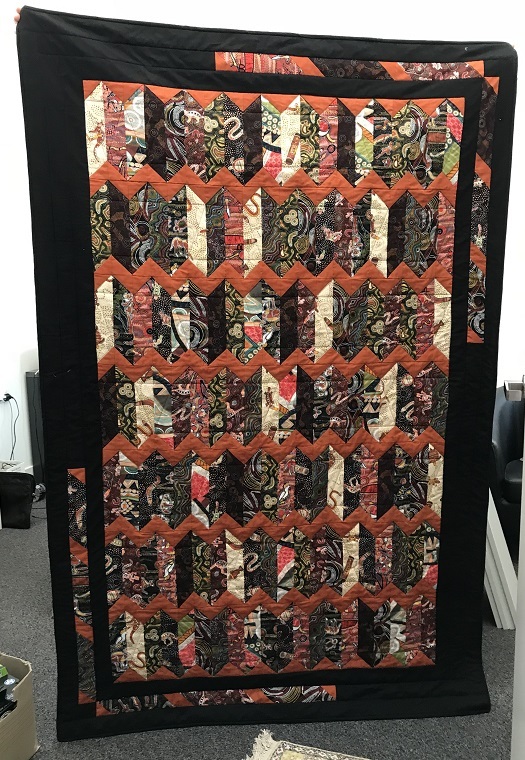 It took me a while to decide how to quilt this one. Using brown thread was pretty much an easy decision. 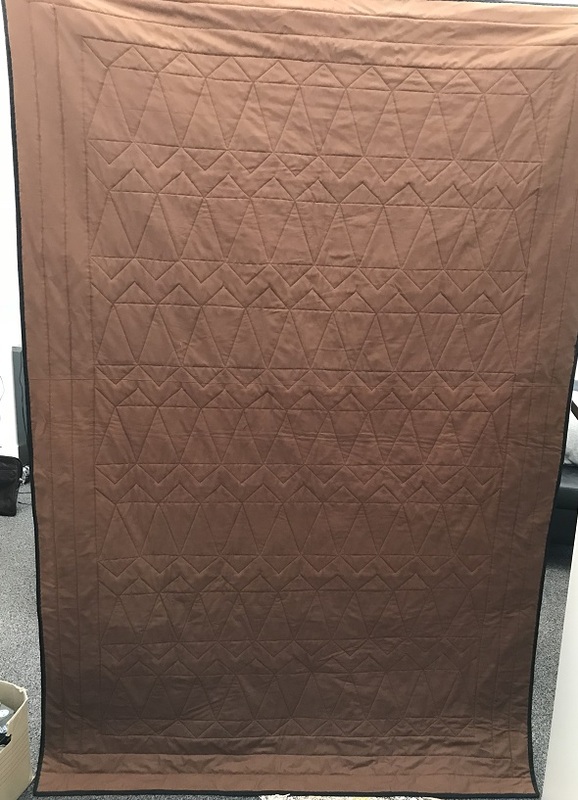 I chose solid brown fabric for the backing, and dark brown thread pretty much disappears on the top. But what stitch design should I use? I got out my rulers! 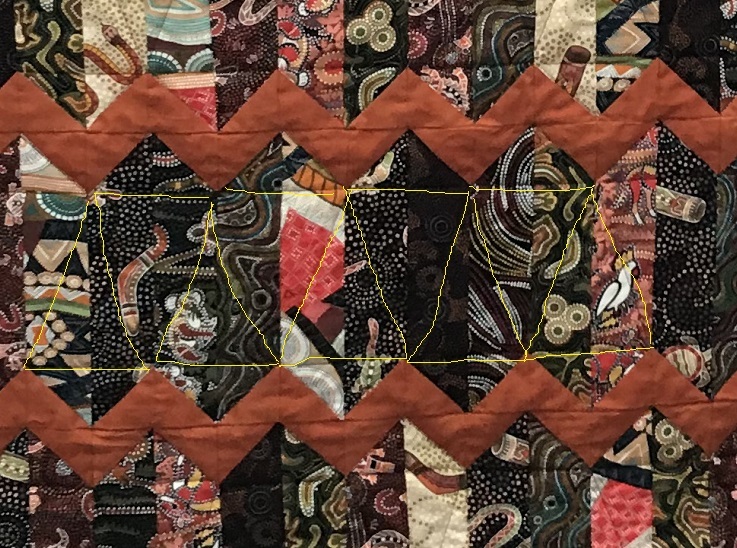 I did a simple, straight-forward stitch-in-the-ditch around the 3 narrow outer borders, then did the same "...in the ditch" around the copper zig zags. 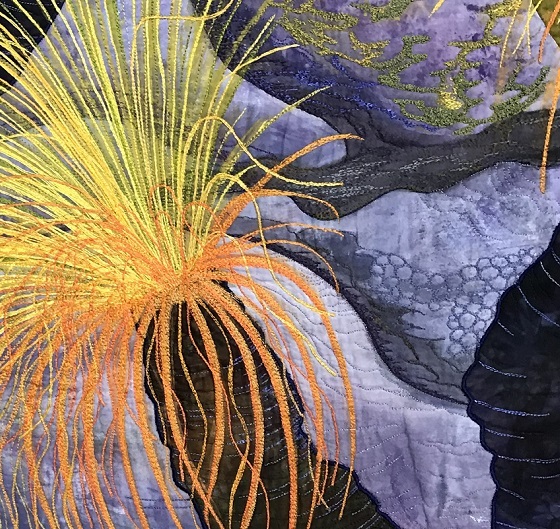 But I needed just a bit more quilting in the large center of the quilt. 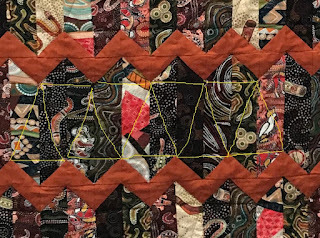 Here's a closeup photo with lines drawn in yellow, showing the stitch pattern for the quilting. It's just inter-connected triangles - simple, really. 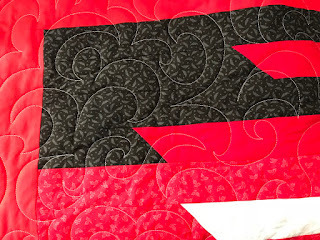 The stitching around the outer borders is easier to see on the back, as is the zig-zag and triangle shapes. All the stitching is done with my rulers (it's just about impossible to keep the lines straight without a ruler). This is the most work I've done with rulers to date. At first it was really awkward working with the ruler, but as I went along, well, I found that once I relaxed it got easier. I still have half the fat-quarters stack I bought at the convention last year. I may just make another one of these!